So, we are about to start another school year. This time around may be one of the most bittersweet for me, yet. The sweet side: Season 5 of Pati’s Mexican Table premieres nationwide this September (here’s a sneak peek)! I can’t believe we have gone from a first season, born out of the sheer passion to share everything from my native country with my new home country, to a fifth season that comes right on the heels of two unexpected Emmy nominations and two James Beard nominations. Super duper sweet because the boys have always watched the episodes with me despite knowing them by heart. They know the episodes names, have eaten the recipes (many times, countless times) and when possible they have tagged along with me to Mexico. 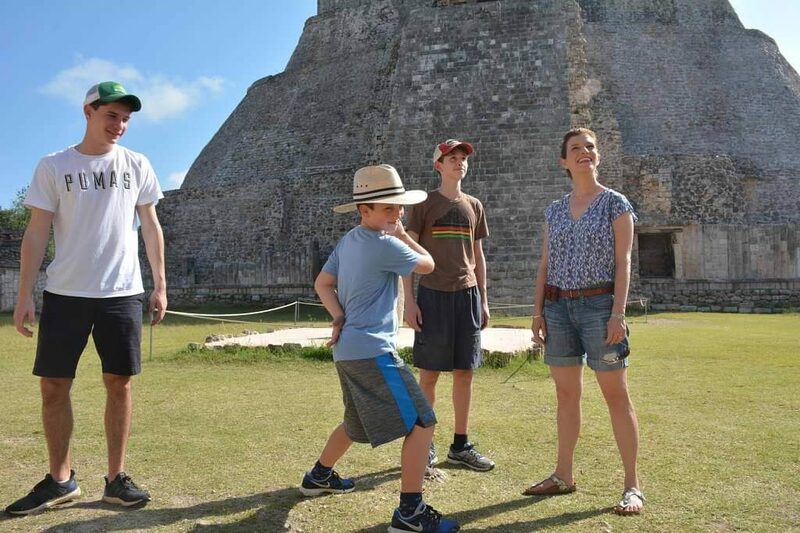 Since this season’s theme is the Maya World, they were able to experience some of the magic of the Yucatán Peninsula: From diving into cenotes, to exploring ancient ruins, to eating the most traditional and the most modern foods from the region. Now, about the bitter: This is the last season Alan will have been a part of while living at home. This is his last year in high school (can you believe it?!?). So I have been worrying about passing on to him as many skills as I can, so he can cook for himself at college. The truth is I even wondered what it would be like if we moved back to Mexico, where kids tend to stay at home until they finish college, or even until they get married (yeah, that was me, after our wedding my husband and I went back to my mom’s house to pick up the bags I had packed that morning). Anyway. I may have already gotten his head spinning trying to explain how to buy every single piece of produce in the market each time we are there. So it was only natural that we ended up with an episode called “Alan Goes to College,” where I tried to show him how easy it is to make some of his favorite things, including these insanely good double-baked potatoes. 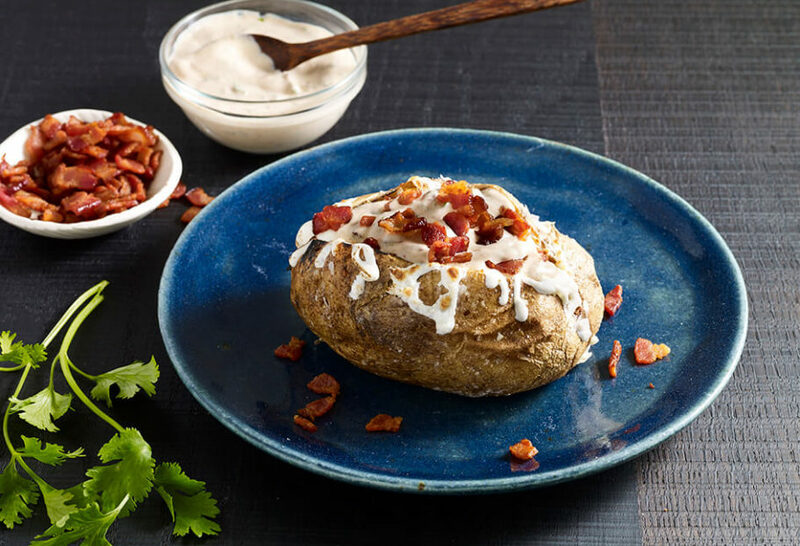 It is truly ridiculous how good those potatoes are, with crispy bacon and FUD Mexican crema and melty Oaxaca cheese. You can make them a whole meal on any school night, too! Using a fork, pierce potatoes all around, about 6 to 8 times. Rub potatoes with olive oil, season with salt, and place on a baking sheet. Bake for 1 hour until tender on the inside and crisp on the outside. In a medium skillet set over medium heat, cook the bacon until crisp and lightly browned. Transfer to a paper-towel-lined plate and set aside. In a small bowl, mix the crema with the sauce from chipoltles in adobo and minced chiles, if using (I do!). Set aside. Remove the potatoes from the oven. Using a knife, cut each one open lengthwise and carefully push the ends together, causing the center to open. Scoop out a couple spoonfuls of the cooked potato meat from each and transfer to a bowl. Sprinkle with salt and mix well. Inside the scooped potatoes, layer a spoonful of the chipotle crema mixture, a spoonful of grated cheese and a spoonful of the seasoned potato meat. Repeat with the crema, cheese and potato meat. End with a bit of crema and cheese. Raise the oven temperature to 500 degrees, or turn on the broiler. Place the stuffed potatoes back on the baking sheet. Return to the oven for 5 more minutes until the cheese has completely melted and has started to crisp. Remove from the oven, sprinkle with bacon and serve immediately. Blessings on your famiky for bringing Alan onto this episode. Made me cry then made me start my shopping list for cooking these baked potatoes for my son. Efxharisto for bringing your boys into our TV kitchen. Oh thank you so much Evyenia…I hope your son loves the potatoes as much as mine. Hi Patti, We like your recipes specially the one’s that are prepared with fewer ingredients, we live in Brisbane, Australia an many of the ingredients needed for those recipes are almost impossible to find if We could open a distribution centre for these products in Brisbane with the help of those big exporting companies from Mexico it’ll be great. I’ll let you know if they turn out well. I’ve been wanting to make loaded baked potatoes for a while now. I was so excited when I saw you make them on your show. I am currently rewatching that episode and making the potatoes in a toaster oven. I’m substituting salami and bologna for bacon. What can I substitute for the chipotle, adobo sauce,and Mexican crema? Would President’s Choice Chipotle Mayo work? Sorry this message is so long. Another thing: Please do more episodes with cooking and grocery tips like the one you did with your son. Best of luck to him in college. Thanks. The mayo you mentioned sounds like a good substitute for those three ingredients! He double baked potatoes were awesome. I did a slight modification but nothing drastic. Adding the bacon in layers like the cream and cheese. Hello Pati, First, I would like to congratulate you on your show. I enjoy watching you cook in company of your family. I have already made some of your recipes which have been a success with my family. I do have a request, If all possible, can you include a picture of your dishes with the printed recipes? I would like to make sure that when I make something it would look similar to yours. I would really appreciate it if it all possible. Thank you and Congratulations again. Thank you Anna Maria for the congratulations and suggestion! I will look into it.. Thank you so much for your comment Tomoko! Super happy to hear you love the show and recipes. Pati, I just recently came across your show. Your food looks so good and I can’t wait to start trying some of your recipes. I can’t tell you what a pleasure and joy it has been watching you cook. I have learned so much about Mexico. It is so much more than a cooking show. I watched this episode last night and was in tears by the end of the show. You have a beautiful spirit and what a great family. I’m so glad I found Pati’s Mexican Table. Brenda, thank you so much for your amazing message. That episode brought me to tears too…the editor had to blur the ending. Thank you for tuning in Betty! I think your boys are so sweet and typical Mexican boys with their Ma! I really like their interactions with each other. The older boys are sweet to Juju, despite their teenage angst! Oh no! I’m gonna fall asleep. Ah, well! I’ll catch it sometime! Thanks for the hours of entertainment! As my General told me, Keep on charging! Emily thank you for your super sweet post! I hope I didn’t keep you up too late ;). Just made this today and it was AMAZING. Thank you Pati for sharing your wonderful recipes! Thank YOU Jannina for trying them! BEST potatoes ever! I’ll never use sour cream again. First use of chipotle chiles in adobo sauce and will not be the last there has to be a great dip recipe for these. I love your show. I love your cookbooks. I love you. Sorry – Not a stalker just a fan of great spicy food. haha…thank you Tony for your sweet message. I can’t believe this was your first time trying chipotle in adobo!!! Here are a few more recipes that use them..but there are more on the website. Pati, I watched your show this morning and it resonated with me so deeply. My son is only a freshman, but I have started to plant the seeds of how he can put some simple meals together for when it’s his turn to spread his wings. I was cracking up over the “toaster vs microwave” discussion…I’m totally with you! But alas, I’m betting the microwave will win out ?. We’ve already established that a rice cooker is a must-have for my son when he starts his college adventure. I just have to make sure he doesn’t try to live on rice alone ?. Just wanted to thank you for the lovely, bittersweet episode — made me tear up at the end, putting myself in your shoes. And of course, as always, the recipes looked delicious. Making the potatoes tomorrow, in fact for Sunday supper. Thank you for sharing your gifts and your beautiful family with us! Thank YOU Karen! Good luck to you and your son when he is ready to start his college adventure. Hola Tasha, Thank you so much for your message, and I am so happy you want to learn more about Mexican food! There are all sorts of tips throughout the website for you to explore. Evelina, I am so honored to be the only show you watch on TV – thank you for tuning in! I discovered your show last year and I watch as often as I can now! My oldest son Bennett is the same age as your Alan…and I saw your ‘bittersweet’ episode where you are giving Alan some cooking tips for is time at college, how cool!! is a Steak and potatoes lover…so I am hoping to show him this episode. 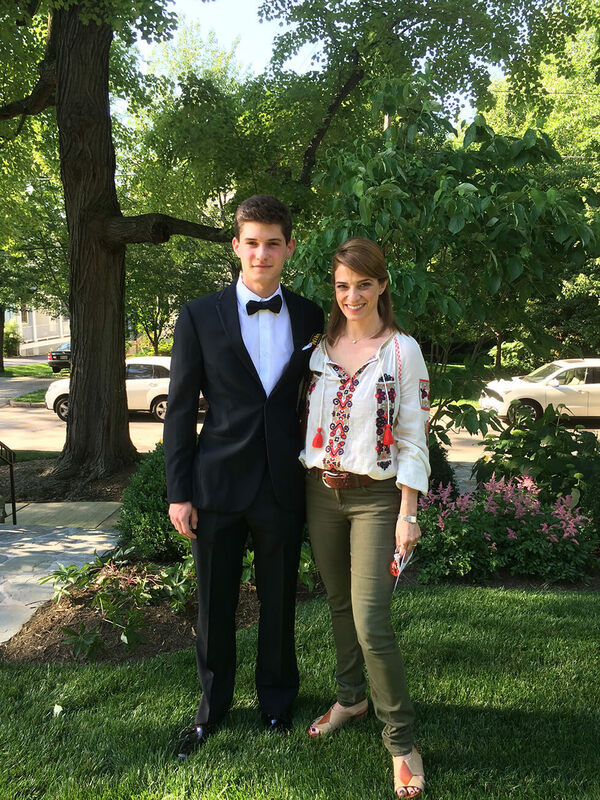 Best of luck to your son Bennett as he heads of to college… and to you too. Hope you continue to like and watch the show, and to try the recipes. I will keep adding more! I saw your cooking channel and ask if I could watch it she said, yeah sure, well after I watched you and your oldest son make the Mexican overloaded baked potato. I ask mom if we could make them she said, yes we can, now I can’t wait to eat them. please tell your son Alan good luck in college for me. Hey! So lovely to receive your email. Of course I will pass on your message to Alan, he will be very happy to receive it. Thanks for tuning into my show, so glad you found me, and good luck to you in the kitchen! Dear Pati, I just saw for the first time and episod of the mini pibis tamalitos! And the coconut dessert. And I just felt in love with your program and your charm. I can’t wait to tell all my family and looking forward for another episode. By the way I’m from Mexico but as you now I live in the US. And I was missing food dearly! But you had made that feeling banish!! I adore your food, Pati! My husband and I are spending this Christmas season in the Yucatan – Merida and Puerto Morelos and all parts in between – so I am very excited that you will have some shows this season about the foods of Yucatan so I’ll know some of the best things to eat while we are there! I can’t wait to go. Yummy! Oh Congratulations on all of these very good things in your life, Pati! I have so enjoyed your wonderful spirit and your authentic, incredible “taste of Mexico!” All of the best to you and these potatoes look marvelous! Todos sus hijos son guapos. Felicidades Alan!